Boom! Studios’ would’ve had an easy win if their Mighty Morphin Power Rangers comic was just pure nostalgia and fan service, directly pointed at the heart of mid-20's nerds like me. The fact that it is exactly that and doing something interesting with its attitude-laden teenagers and the franchise simultaneously makes it surprisingly compelling reading. Written by Kyle Higgins and with art by Hendry Prasetya and Matt Herms, the Power Rangers ongoing has cemented itself in a particularly interesting period of the classic show’s history—i.e., shortly after Green Ranger Tommy, who was introduced as a brainwashed minion of Rita Repulsa on the show, becomes the team’s sixth ranger. From a fan’s point of view, this means that you’re getting to see the full team in action (although it has been modernised, so they’re 2016 teens and not ‘90s kids). It is the original Power Rangers arguably at the peak of the show’s initial popularity. That of course means peak fanservice, too. 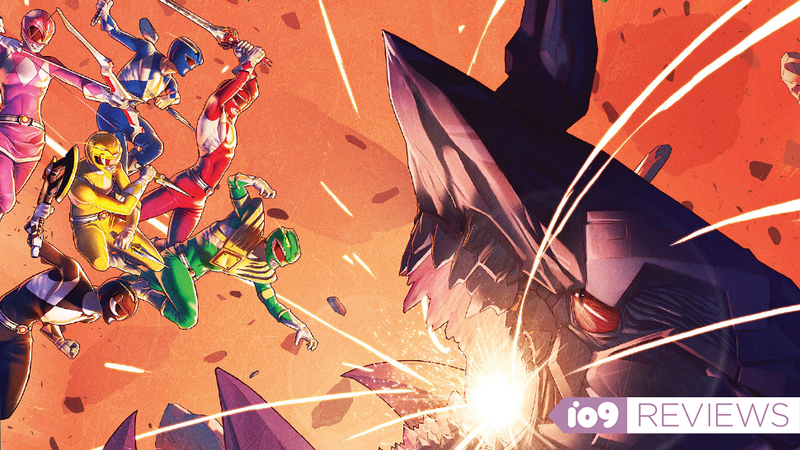 From the vivid colors to the fact that you get your first, triumphant morphing sequence just five pages into the first issue, Power Rangers thrusts its power sword right into the heart of the biggest fan almost instantaneously and never let itself go. Moment to moment, whether it’s the Ranger action, the megazords, or even Rita’s hilarious maniacal laughter punctuating her every plot, Power Rangers is a gleeful buffet of nostalgia. Even doubly so when you get to the the Steve Orlando/Corin Howell/Jeremy Lawson-created backup stories in each issue that focus entirely around Bulk and Skrull, which provide the high-school-hijinks balance to the grand action and drama of the main story. Higgins clearly adores the Rangers and the wider series itself, and that adoration oozes out of every set-piece and character beat. And the same goes for Prasetya’s art, posing the Rangers, monsters, and Zords exactly how your brain remembers them looking on the show. Herms’ color work, while not ‘90s-era garish, is bold and vivid in all the right places. Visually, the series is so on point it almost feels like someone’s dug up an old VHS of a few episodes and turned it into a comic book. And as I said, that would be more than enough for many people who remember the show as kids and just want to relive it again. The first four issues of the book have offered more than enough crazy action in that regards to tickle that fancy, reverent to the icon that Power Rangers has become. But Higgins, Prasetya, and Herms don’t let that reverence get in the way of them actually doing something with these characters, and the team dynamic between the core Rangers and Tommy. It’s this which elevates the Power Rangers comic well above the realm of nostalgic cash-grab. The story over these first four issues has focused around Tommy’s lingering doubts about his freedom from Rita’s mind-control. He still gets flashbacks and hallucinations of the time he was her instrument, and having yet to be fully accepted by the rest of the team plays heavily on his arc. Likewise, when Tommy’s visions impact upon an early mission for the Rangers, we get to see that there are more than just seeds of doubt among the rest of the team—especially Jason and Zack. The original series pretty much brushed aside Tommy’s past as the “evil” Green Ranger after he joined the team, but by having it linger throughout this first arc of the comic, and to see the team bristle and slowly fracture—and have Rita actually come up with a plan to exploit their disharmony, instead of being the typically cartoonish villain she always has been—over whether or not Tommy can be trusted makes for some truly compelling drama inbetween the giant, high-octane action sequences. It actually makes these characters feel like “teens with attitude” where attitude doesn’t mean “riding on skateboards and being totally radical” or what have you. These kids are raw, inexperienced, and lash out at each other in ways that make them feel like young adults, instead of adults trying to play teens. After all, the whole moral core of Power Rangers relies on the belief that standing together is better than standing alone, that teamwork is the real superpower (and not, somehow, the magic weapons and giant robots). Playing with the morality that has defined the show ever since it first began over two decades is both a surprising move for anyone expecting this book to be a safe nostalgia play and a welcome one. The Power Rangers show might have been about more the monsters and big pyrotechnics, but the drama the comic adds to that instils the series with an added weight—but not too much weight that it no longer scratches that Power Rangers itch—that has so far made it one of the most solid and enjoyable comics out there. Mighty Morphin Power Rangers Vol. 1, collecting issues #0 to #4, hits shelves September 13, at comic stores and online. A copy was provided to io9 for the purpose of review.